SCG is giving us a new twist on Modern for their first convention. There is a lot to unpack for this, so start by pulling up the banned list. These are the cards being unleashed into Modern for the SCG event. Some of these cards are likely to show up in almost every deck **CoughMentalMisstepCough**. Others are going to turbo charge specific decks. Still others are likely to be left in the dust, as they are eclipsed by more powerful cards that are also coming out to play. Let’s get started. 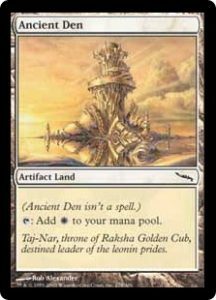 Ancient Den is part of the cycle of artifact lands that helped Affinity dominate during their time in Standard. The full cycle of lands was banned at the beginning of the format, so there isn’t much relevant data to work with. Old Standard Affinity decks were filled with Frogmites and Myr Enforcers, along with a period of time with Skullclamp. Modern Affinity has a huge upgrade with Mox Opal, along with some additional payoff cards in Steel Overseer, Master of Etherium, and Etched Champion. If you want to work with the artifact lands, you’ll need to figure out how to merge the old and new lists. The benefit of the older lists was increased speed in dumping your hand and super charged Arcbound Ravagers and Cranial Platings. The new Affinity list has a bunch of creature lands which help the resiliency of the deck. Inkmoth Nexus in particular helps win some games that Affinity would otherwise struggle with. My first take on merging the Affinity decks would be cutting Spire of Industry, Glimmervoid, and Blinkmoth Nexus for various artifact lands. There are good options for each colored land besides green. 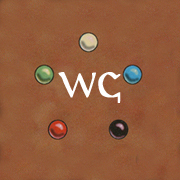 White offers Stoneforge Mystic as additional copies of Cranial Plating and Skullclamp. Red offers Galvanic Blast and Shrapnel Blast. Blue offers Master of Etherium, Thoughtcast, and Ensoul Artifact. Black offers Disciple of the Vault. I’m not sure where to take the deck specifically, but there are plenty of options. Outside of Affinity, I don’t think Ancient Den is going to find a home. 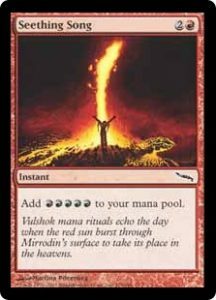 Birthing Pod has only been banned for a few years, so you can pretty safely pull from old lists here. There are a few upgrades to be had without touching banned cards, since I think Vizier of Remedies and Devoted Druid can probably slot in somewhere. Beyond that, Deathrite Shaman should be an auto-include, along with Green Sun’s Zenith and Dryad Arbor. Stoneforge Mystic and Skullclamp might also fit, but I’m not sure how many new cards you’ve got room to for. I honestly don’t think Birthing Pod is good enough. It isn’t fast enough to race some of the busted combos that are available, and it doesn’t offer enough protection to go slower. If you insist on playing Birthing Pod, I think I might ditch the traditional Abzan lists for something faster. Ari Lax championed a four color version of the deck that comboed with Deceiver Exarch and Kiki-Jiki, Mirror Breaker. Blazing Shoal was added to the banned list after the first Modern Pro Tour, where Infect decks used it to kill as early as turn two. This deck came about due to the Cloudpost deck from PT Philadelphia. That deck won on turn four fairly consistently, and everyone knew about it. If you wanted to do well in that format, you needed to be prepared to interact with it or race it. This Infect deck was the best example of a deck built to race a turn four deck. When someone imagines a combo deck in a no banned list Modern tournament, Blazing Shoal should come to mind. A turn one Inkmoth Nexus can result in a turn two win with Blazing Shoal. There are several tutor cards for each piece of the combo, along with several protection cards. If the deck is going to stay one color, there are still some strong additions available with newer cards. Some amount of Treasure Cruise and Dig Through Time belong in this deck, at least over Peer Through Depths. Delve cards will encourage more fetch lands and Gitaxian Probes, and the fetch lands might prompt more of a splash color. With Peer Through Depths gone, you can consider more of a Summoner’s Pact package (switching Dragonstorm for more Progenitus/Reaper King). Other banned cards worthy of consideration are Chrome Mox and Mental Misstep. I haven’t mentioned Mental Misstep yet, but I expect it to be a ubiquitous four-of in almost every deck. I’ll get more into that when I reach it on the list. Bloodbraid Elf is the most common card people refer to when discussing cards to remove from the banned list. That doesn’t bode well for it in a no banned list format. I’m not even sure where to start, since all the homes that come to mind are way off from what I’d suggest. 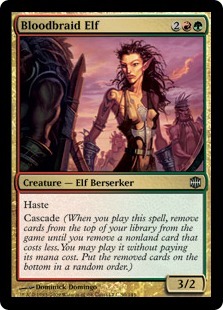 Bloodbraid Elf is a fine curve topper for something like a Zoo deck or disruptive Jund deck. Unfortunately, I think Cascade as a mechanic gets worse if you have to play with cards like Mental Misstep. Maybe Jund with a Vampire Hexmage/Dark Depths combo could use Bloodbraid Elf. I think you’re going the wrong way if you reach the point where you consider BBE in your deck. Unlike several cards on the banned list, Chrome Mox doesn’t have a specific home to point towards. Realistically, any combo deck should be considering it, since it can potentially speed a deck up by a full turn. Control deck should also be interested, should any exist. 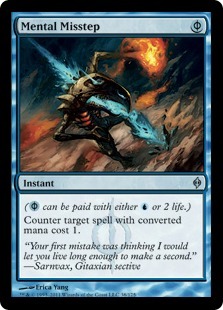 Having two mana up on turn one for a Remand or Mana Leak is going to be useful in a format without Force of Will. 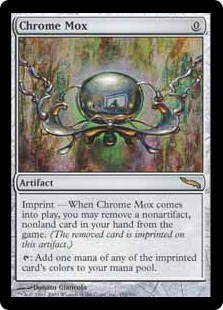 Honestly, Chrome Mox is the first of a list of cards you should be considering for any deck in the format. It is inconsistent, but I expect the velocity is too important for a lot of decks. If you like playing with Tron lands, you’re going to love Cloudpost. The first Modern PT was defined by decks like this. The first versions of Tron weren’t developed until well after this tournament, so there should be plenty of ways to experiment with this deck. 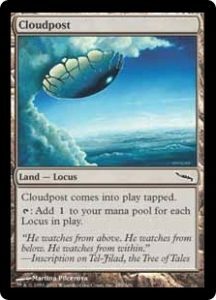 Cloudpost ramp, combined with Green Sun’s Zenith for Dryad Arbor on turn one, made reaching Primeval Titan or Through the Breach trivial. Twelve Post is the first deck I’ve gotten to that uses Grove of the Burnwillows and Punishing Fire (out of the board). This duo is pretty much lights out against anyone hoping to play fair with creatures. I’m worried about promoting this deck too much. The formula for solving it was figured out for that PT, and it won’t pick up too much off the rest of the banned list. It is clearly possible to race this deck, and Splinter Twin decks are very favored against big mana decks. The rival for Inkmoth Nexus for combo lands, Dark Depths should be a big part of no banned list Modern. Dark Depths, Urborg, Tomb of Yawgmoth, and Vampire Hexmage make an indestructible 20/20 creature on turn two. This was a defining part of old Extended before Modern was invented. This particular list combines the Dark Depths combo with Thopter/Sword. 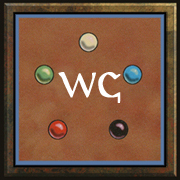 It is a classic example of fusing two combos together to increase the overall strength of a deck. Dark Depths has some new toys available that weren’t printed in old Extended. Thespian Stage is the best known one, since Legacy Lands uses it as a combo. 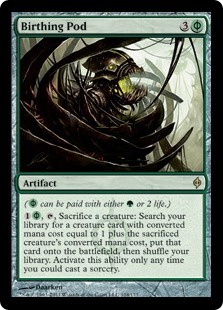 The newer addition is Solemnity, which I think might be the best way to go about building a Dark Depths deck. I expect Inkmoth Nexus to be fairly popular, and Solemnity is a proactive way to fight Infect along with being a combo piece. 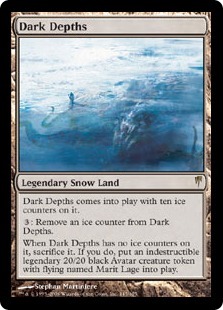 If nothing else, I expect Dark Depths to be a fairly common win condition for the slower decks in the format. Thoughtseize and Inquisition of Kozilek are still going to be the best forms of interaction, and some combination of Dark Depths, Vampire Hexmage, and Thespian Stage should fit into that shell nicely. Deathrite Shaman got to wreck havoc on Modern for a few years before it got a ban. It serves as a mana ramp creature that doesn’t lose utility later in the game. Oh, and it randomly hoses various graveyard strategies. Decks that Deathrite Shaman should fit into include Elves, G/B/x midrange decks, Birthing Pod/Collected Company decks, anything else that plays Birds of Paradise, and whatever Death’s Shadow morphs into without a banned list. Honestly, any deck playing green or black should consider Deathrite Shaman. Particularly if you are anywhere close to playing a fair deck. There are going to be a few homes for Dig Through Time. 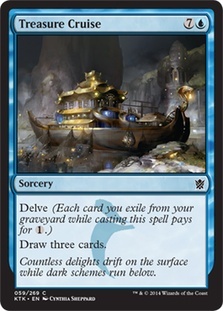 Any deck playing basic Island should be considering Dig Through Time or Treasure Cruise, and possibly both. Dig Through Time is better in decks that are looking for specific cards (and don’t mind the extra blue pip in the cost), while Treasure Cruise goes in decks looking for raw cards. That means I expect Dig Through Time to be the preferred card for various combo decks, while Treasure Cruise will be more at home with cards like Monastery Swiftspear or Delver of Secrets. That said, I expect you can fit up to 5-6 copies of these cards into your deck if you don’t need your graveyard for anything else. Don’t discount the idea of playing copies of both. I expect Splinter Twin to be one of the more popular decks in the format, and Dig Through Time is a phenomenal addition to that deck. With Dread Return and Golgari Grave-Troll, Dredge is as close as it gets to full strength in Modern. Cabal Therapy, Lion’s Eye Diamond, and Ichorid would be nice, but we can make something work anyway. With Dread Return, Insolent Neonate, and possibly Greater Gargadon, Bridge from Below starts to look promising. There are some different giant creatures to work with if you are reanimating. The most obvious is something like Flame-Kin Zealot or Dragonlord Kolaghan to give all your Bridge from Below tokens haste. 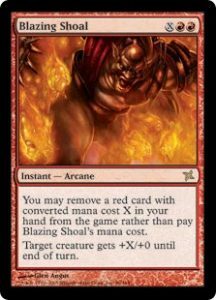 Griselbrand is a great target halfway through a combo turn, easily dredging through the rest of your deck. Flayer of the Hatebound can give you a combo finish. Lastly, Iona, Shield of Emeria or Blazing Archon can shut your opponent out while you win with something like fliers or Conflagrate. Watch out for Deathrite Shaman. Street Wraith is an excellent addition, giving you an instant speed Dredge when you need it. I think we’ve seen the maximum level of degeneracy available with Eye of Ugin already. Thought-Knot Seer and Reality Smasher are excellent when you deploy them early, and that deck ran rampant for a full season before Eye of Ugin was banned. Before that deck, Eye of Ugin was the method Tron and Twelve Post decks used to prevent flooding out. 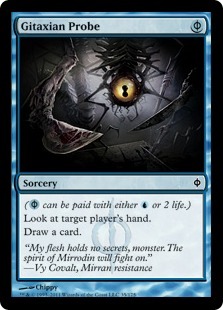 Eye of Ugin should do very well, but that will be in large part to the cards surrounding it. 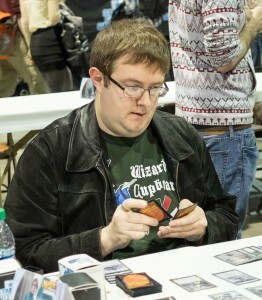 Chalice of the Void is going to be excellent in a format full of Mental Misstep, Ponder, and Preordain. Eye of Ugin decks can completely sidestep that, along with punishing decks that rely on those cards. You can also look to the various colored Eldrazi decks that appeared throughout that season, but I think they might be worse. You loose your immunity to Mental Misstep with a lot of the color splashes, but it might be worth it. Gitaxian Probe is another card I expect to see widespread play in no banned list Modern. There are plenty of combo decks that really want to make sure the coast is clear to go off. There are also plenty of decks filled with Treasure Cruise and Dig Through Time that are just looking for free fuel. Lastly, there is Death’s Shadow, which is honestly a combination of both of those decks. 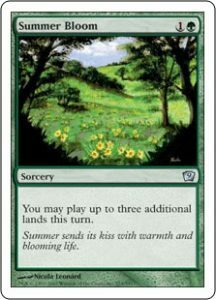 There is probably only one deck that is interested in Glimpse of Nature, and that deck is Elves. 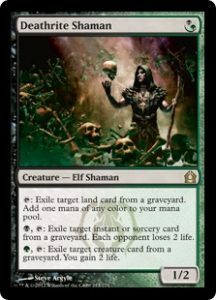 Elves receives a pile of upgrades in no banned list Modern with Glimpse of Nature, Skullclamp, Deathrite Shaman, and Green Sun’s Zenith. Mashing those together into a cohesive deck shouldn’t be too hard, but several cards have to make their way out to facilitate all the new additions. The Vizier of Remedies infinite mana combo can probably go, since the deck is probably maxed out at Green Sun’s Zenith and Collected Company for spells. Heritage Druid needs to be maxed out, as it is the best way to go off with Glimpse of Nature. Craterhoof Behemoth might be the best way to win, but I’m somewhat inclined to believe that stringing together Shaman of the Pack might be more efficient (if you can solve the black mana problem). That version might want to consider Cloudstone Curio, but that might be going a little too deep. Ezuri, Renegade Leader is probably the best option still, but you can cut down to a copy or two with Green Sun’s Zenith. Don’t forget to slot in a single copy of Dryad Arbor for the Green Sun’s Zenith. This is another deck that I might have to discourage. All of the best additions Elves gains are cards countered by Mental Misstep. There might be enough raw power to work through that, but I’m not sure this deck is worth the effort. Elves also has to contend with Punishing Fire, which might be too much. There is a lot of hate for the little green folk out there. I covered most of the aspects of Golgari Grave-Troll with Dread Return. 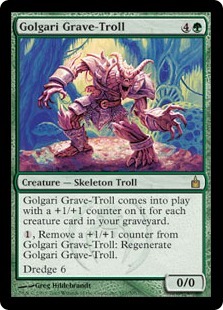 However, any Dredge deck will instantly max out on Golgari Grave-Troll, while Dread Return requires some work to identify the correct number. Golgari Grave-Troll also offers Flayer of the Hatebound as a legitimate win condition to Dread Return. Reanimating both should deal well over twenty points of damage. Affinity is the clear home for all of the artifact lands. I already covered that home with Ancient Den, but Great Furnace might have a few other niche applications. If you really want to do something degenerately aggressive, Kuldotha Rebirth really appreciates a red artifact land. 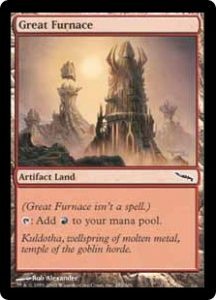 If you want to dial it back a little bit, Burn could consider Shrapnel Blast with a set of Great Furnaces and a set of Darksteel Citadels. 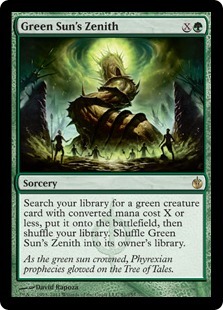 I’ve covered several possible homes for Green Sun’s Zenith already (Birthing Pod, 12 Post, and Elves), but Green Sun’s Zenith probably belongs in any green deck. The ability to ramp on turn one for Dryad Arbor is incredibly strong, considering that Green Sun’s Zenith also counts as a payoff card once you’ve ramped up to your expensive cards. If you’re playing any deck that can realistically have green mana on turn one, consider Green Sun’s Zenith (followed closely by Deathrite Shaman). Hypergenesis does some messed up stuff, cheating a huge array of cards into play incredibly early. 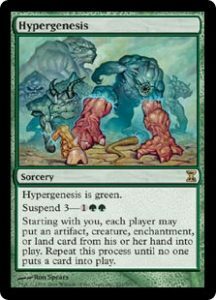 Hypergenesis is another card that has been banned since the inception of the format, so there isn’t a ton of data to work with. Legacy Hypergenesis is technically a deck, but it hasn’t put up any notable results in years. For those of you that haven’t seen the deck before, it plays like a Living End deck. The deck is filled with a few copies of Hypergenesis, several cards with Cascade, and a bunch of payoff cards. In Living End, those are all the cycling creatures. In Hypergenesis, you just run a bunch of super expensive cards. The biggest addition to this deck feels like As Foretold, prompting you to actually play a full set of Hypergenesis. There isn’t a ton of other cards you can realistically play, unless you want to move off the Cascade plan. That might honestly be better, since simply porting the legacy version starts with this this. Several of the cards we lose don’t have any real replacement in Modern. None of the counterspells are legal, and you lose Shardless Agent as a Cascade card. The biggest blow might be a loss of Elvish Spirit Guide, dropping the ability to combo on turn two dramatically. A version that focuses on As Foretold opens the deck up to a ton of selection with Ponder and Preordain, but you drop down to four copies As Foretold to actually cast Hypergenesis. The key might be something like the Goryo’s As Foretold deck that came in second at the SCG classic on 1-28-18. Swapping out Living End for Hypergenesis lets you move in on Emrakul, the Aeon’s Torn. 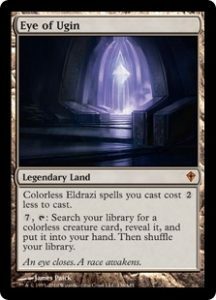 You can still keep some amount of the Kiki-Jiki package or Griselbrand, or you can move more towards more power with additional Eldrazi. 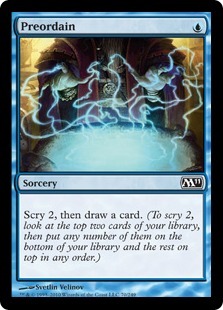 If you really need to play control, you could do worse than Jace, the Mind Sculptor as a win condition. I’m not really sure where Jace actually slots into the format, but it’ll be excellent if you can find a way to survive against the various combo and ramp decks. 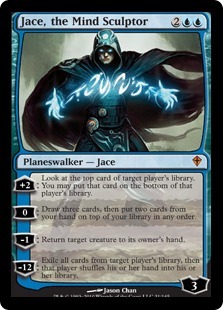 If your combo deck is blue and not incredibly fast (think Splinter Twin), a copy or two of Jace might serve you well. If your deck is actually a control deck, I imagine you were already planning on trying Jace. One additional point of note, you can play the Sensei’s Divining Top/Counterbalance lock in no banned list Modern. I’m not sure if you want to go full on Miracles from Legacy, but the deck does an alright job of porting to Modern. 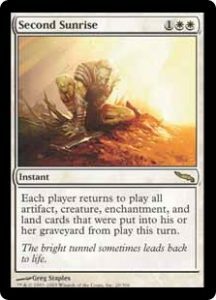 Losing Force of Will is really rough, and I’m not sure how you fix that hole. If you think you can get there with Disrupting Shoal, the deck seems good. If you played with Mental Misstep in Standard, it probably didn’t seem too bad. If you played with it in Legacy, you know how awful it really is. The better the one drops are in a format, the stronger Mental Misstep gets (well, that sounds obvious). That starts to force non-blue decks to run Mental Misstep to actually protect their one drop spells from an opponent’s Mental Misstep. The end result is usually just forcing both players to mulligan a card or two as a result of fighting Mental Missteps. Mental Misstep actually gets even stronger in a format with Treasure Cruise and Dig Through Time. 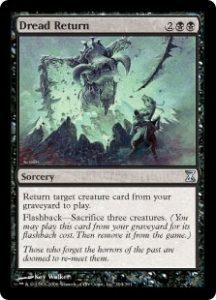 If both players start with a copy of Mental Misstep in the graveyard, it’s even easier to go off with Delve cards. Building a deck with Mental Misstep isn’t really the issue. You should do your best to fit a full set in your deck. The real trick is to mitigate the damage an opposing Mental Misstep does to your deck. This is the biggest reason I don’t like Elves as a deck, since gaining Glimpse of Nature and Skullclamp just makes you weaker to this miserable counterspell. If you’re playing a blue deck, I can’t imagine not playing a full set of these. There was a point in history where that wasn’t standard deckbuilding. I think we are past that mistake now. Be careful not to fill your deck up completely with air. If you try to fill your deck with a set of Ponder, Preordain, Mental Misstep, Treasure Cruise, and Thought Scour, you’re down to only five or six playsets of cards that actually do something. Be sure to keep a decent mix of velocity spells and actual gas. See Ponder. I expect Preordain will be smidge worse, since fetch lands are available to shuffle away the worst card or two with Ponder. A full set of Preordains on top of a full set of Ponders might be too much, but I’d guess it’s closer to right than wrong. If your deck is playing red, I would honestly play a set of Punishing Fire over a set of Lightning Bolt. The combo with Grove of the Burnwillows is disgusting, and it should make your matchup against aggressive decks skyrocket. Repeatedly murdering creatures will do that. 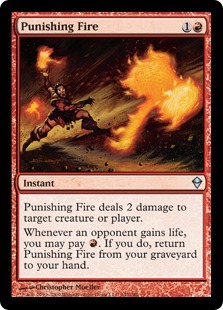 Punishing Fire could also serve as a really slow win condition in a Counterbalance deck or something. I’m not sure the format has enough permission to plan for games going that long, but maybe someone will discover something that I missed. I haven’t really talked about Storm yet, but no banned list Modern gets all of the original Storm toys back. 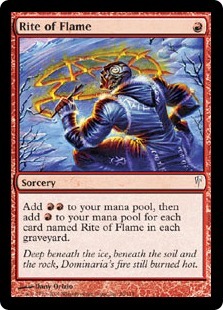 Rite of Flame is a significant boost over Pyretic Ritual, and it should slot in easily. There could theoretically be some other ritual deck like Dragonstorm, but I can’t imagine something being better than the older Storm decks. Storm hasn’t gained nearly as much as it’s lost, so old decklists should be easy to find and modify. Don’t forget to add some Delve cards along with improving the cantrips to Ponder and Preordain. The older versions of Storm went off with Pyromancer’s Ascension, so don’t forget that card. 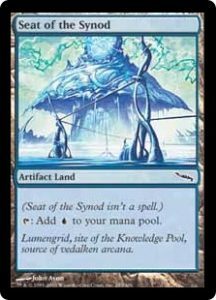 I talked about the artifact lands in Affinity already (see Ancient Den). Seat of the Synod has a few other potential homes. Anything considering Trinket Mage might want a single copy to tutor for. Thirst for Knowledge is another card that might encourage some Seat of the Synod in the manabase. Christ, I don’t even know where to start with this deck. You can play this deck again, as Second Sunrise was banned specifically to remove this deck from the format. It’s a slow, complicated combo deck that takes 20 minutes to kill someone with a Pyrite Spellbomb. If you want to work on this deck, don’t let me stop you. Eggs is one of the few decks in Modern I haven’t even tried before, and it’s been too many years since I’ve even seen it played. I wouldn’t know where to start modifying it. Well, I do know you can upgrade the cantrips. That one is easy. Seething Song is another clear addition to Storm. Like I mentioned with Rite of Flame, you should be able to pull up old storm decks to work from. That deck has lost more to bannings than it has gained from new cards. So many people are going to go to time each round. Sensei’s Divining Top was banned form the onset of Modern simply due to the excessive time it can take to use. That said, the power level of the card is unmistakable. 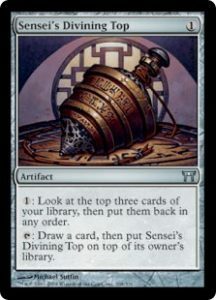 Sensei’s Divining Top is going to fall in the list of cards that every single deck should consider playing. 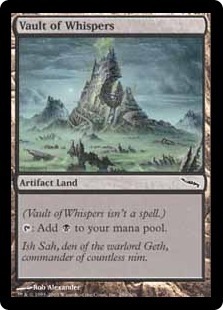 Fetch lands are already ubiquitous in the format, so top makes card filtering a joke. Combo decks can use it to help dig for pieces, and fair decks can use it to find answers. Expect to see a lot of this artifact. I mentioned this earlier, but Counterbalance is also legal in Modern. Your blue deck has the option for this lock if you find the right shell for it. Entreat the Angels and Terminus are also legal, leaving you a Force of Will away from Legacy Miracles. I think I’ve already covered Skullclamp in some of the strongest homes (Elves and Affinity), but several other decks should consider it. 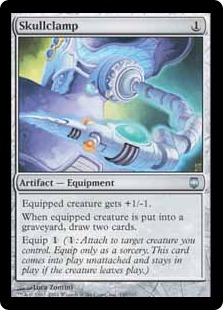 Any deck that generates X/1 creatures can use Skullclamp as a source of repeatable card draw. It’s a little slow if your deck doesn’t make tons of mana, which is why I think it is strongest in Elves and Affinity, but it’s still reasonable in some other homes. Any deck with Birds of Paradise Deathrite Shaman should consider it. Skullclamp into Bitterblossom is just good, clean fun. Splinter Twin is on my short list for strongest deck in the format. It is a powerful deck with a long track record of success, and it can make use of several cards on the banned list. Not only can it play several banned cards, the deck shell can consist of banned card draw/selection, interaction spells, and only nine or ten cards devoted to the combo. 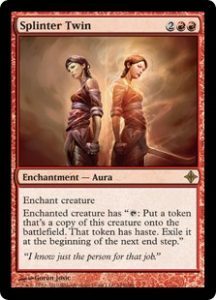 Splinter Twin feels like the control deck of the format. It is probably the best Remand deck I’ve ever seen, and that card’s stock skyrockets in a format desperate for a good two mana counterspell. This is my first guess at a list. I’m sure the numbers need some work. If you are doing anything remotely fair and you’re in white, you should probably be playing Stoneforge Mystic. With Batterskull, Umezawa’s Jitte, and Skullclamp available, Stoneforge Mystic has a wealth of busted options to pick from. If you’re looking to relive the old days of Caw Blade, you’ve got all those tools and more available. Path to Exile is still one of the best removal spells available, particularly with the appearance of Marit Lage tokens. Jace, the Mind Sculptor is still great, and I already talked about him. Stoneforge Mystic will easily fit into any kind of white Death and Taxes list too, but I have no idea how good those decks are. 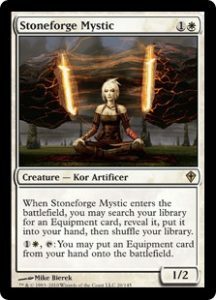 Stoneforge Mystic is another strong home without a specific deck to slot it into. Consider it if you are already in white. 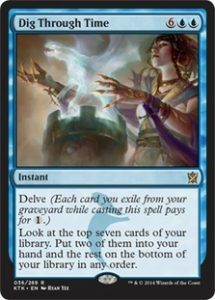 If you’ve got a deck idea that needs some additional power to flesh out a list, a Stoneforge Mystic package is far from the worst you could do. Like Eggs, Summer Bloom was banned to remove a specific deck from the format. Also like Eggs, I never had much of a chance to try that deck. That leaves me in an awkward position if I wanted to try making suggestions for it. I’ll go with the easy answer and simply decline to make suggestions. One point I do feel confidant in making is that Mental Misstep is rough for this deck. Amulet of Vigor is one of the best cards available, and it is much less likely to resolve in this new world. Most of my opinions on Dig Through Time apply to Treasure Cruise. If your deck simply needs as much cardboard as possible, or if the second blue pip in Dig Through Time’s mana cost is prohibitive, Treasure Cruise is the card for you. A few months of Treasure Cruise easily showed us the power level of the card in Modern. 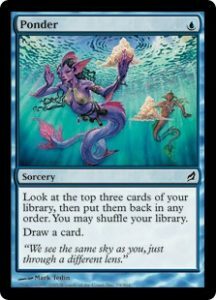 You should really have some number of copies of Dig Through Time or Treasure Cruise if you’re playing blue in Modern. I already covered artifact lands in Affinity with Ancient Den. 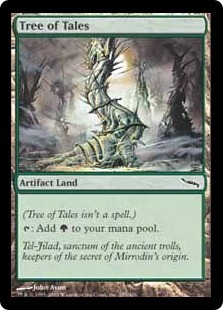 Tree of Tales seems like the worst option by a mile, as green mana is the least useful color for Affinity. There isn’t really any other green deck with a desire for artifact lands either. 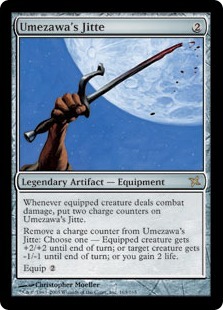 If you’re playing a creature deck, you should have some number of Umezawa’s Jitte in your deck or sideboard. It’s only alright against non-creature decks, but it absolutely dominates combat. Stoneforge Mystic is legal too, making it easy to find a copy. Umezawa’s Jitte is also very close to Batterskull in terms of raw speed, since the Jitte can add four damage a turn after it gets the first round of counters.Umezawa’s Jitte is going to compete with Punishing Fire as a way to remove small creatures from the board. No banned list Modern is looking very hostile towards small creatures. We can end on the same cycle as we started. I already covered artifact lands in Affinity. Vault of Whispers might have some hope if someone finds a way to use Disciple of the Vault again. I’m not sure if there is another use for Vault of Whispers. Chrome Mox, Dark Depths, Deathrite Shaman, Dig Through Time, Gitaxian Probe, Green Sun’s Zenith, Jace, the Mind Sculptor, Mental Misstep, Ponder, Preordain, Punishing Fire, Sensei’s Divining Top, Skullclamp, Stoneforge Mystic, Treasure Crusie, and Umezawa’s Jitte should all be on your list of considerations if you are playing those colors. The other cards have more specific homes. Mental Misstep, Punishing Fire, and Umezawa’s Jitte make small creatures look extremely unappealing. This is an absurd group of punishing cards for anyone looking to battle with X/2 or smaller creatures. Mental Misstep is going to be a dominating force in the format. If your deck relies on resolving a one drop spell, every deck in the format has an answer for it. Modern has enough strong one cost cards that every deck has access to some good ones. Plenty of new combos are available. I like the ones that don’t require a full deck to function since they have more room to squeeze in additional banned cards. Decks like Amulet Bloom or Eggs will need some work make room for anything beyond their old namesake cards. I like Ghost Quarter in most decks, since I expect Dark Depths to be a fairly common win condition. Tolaria West also looks like a great card. Finding Inkmoth Nexus, Dark Depths, or Hypergenesis is a potent ability for a land. Finding Ghost Quarter for opposing Dark Depths is just icing on the cake. Look around for any results you can find online. Stores might run their own tournaments, or people might be brewing for the SCG event. Make sure you play a deck you enjoy. Events like this are rare, so take advantage of the opportunity. Best of luck with your brewing!